New images are up over at my gallery of early aircraft design. If you ever thought combining an airplane with a submarine would be a good idea, you weren't the first. Historic footage of tidal wave damage can be found at British Pathe. The video collection includes images of 1926 damage in Italy (left) and a devastating 1923 earthquake and tsunami in Chile. If you scroll to the bottom you'll find video of a 1947 tidal wave in Japan that caused widespread damage. Don't be put off by the shopping cart at British Pathe. The video images are free to preview. A running list of tsunami video and mirrors is available at Cheese and Crackers. New to the site today is a gallery of early aviation design. The art is from the 1930s, 40s and 50s. I dug through the archives of the U.S. Patent Office to find these images and I still have about 120 left to post. Clearly a number of these planes never had a shot at getting off the ground, but the retro styling is what caught my eye. A mysterious, tight-lipped, jet-setting backgammon player. 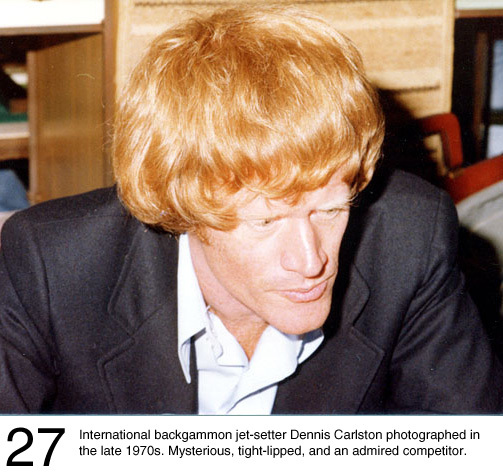 And yes, I do have a link to more backgammon photographs from the 1970s. "Mix (at room temperature) and stir savagely until it is no longer streaky in color. Each drink should be served with a toothpick impaling a dead bumblebee, a dead yellow jacket and a dead wasp. These are supposed to be eaten first to give the revelers a notion of what lies in store for them." A report by Classified Intelligence estimates San Francisco area newspapers loose between $50 and $65 million annually in revenues to Craigslist. According to the study, Craigslist had 12,200 active job listings on its San Francisco site the week of November 21, 2004. In contrast, the San Francisco Chronicle had 1,500; the Oakland Tribune had 734; the San Jose Mercury News had an estimated 1,700; and the Contra Costa Times had around 1,000. For economists the public financing of Major League baseball stadiums does not make sense. "Subsidized stadiums require subsidies forever," says Scott Wallsten, a resident fellow at the American Enterprise Institute in Washington. "And they don't generate benefits to the neighborhood, typically. The jobs they create are small in number, low paid, and temporary." But there are other non-economic advantages to having a team in the city. Culturally a team can bring a community together and offers an enjoyable entertainment option. A purveyor of pop-up ads says the format is on a steady decline, even as his firm rolls out new, guaranteed to pop, tools. Despite the rise in pop-up blocking tools, pop-ups are still the most hated ad format, according a 2004 survey from Jakob Nielsen. It's not in Falk's interest to defend the pop-up, Apprendi said, but to place more control back into the hands of the company's publisher clients. A new worm that uses Google to find victims has infected and defaced nearly 40,000 web sites. The worm sends Google a specific search request, essentially asking for a list of vulnerable sites. Armed with the list, the worm then attempts to spread to those sites using a PHP request designed to exploit the phpBB bulletin board software. Free from American Digest: A copy of The Quotable Sherlock Holmes. At Agoraphilia Tom W. Bell weighs the costs and benefits of maintaining the Santa myth. Santaism imposes large costs on parents, both the moral costs of lying and the opportunity costs of losing credit for well-regarded gifts. Yet Santaism does not appear to offer countervailing benefits. You don't need that mythical construct to tie good behavior to good gifts; parents routinely use carrots and sticks to get their kids to act appropriately. Tom lists some costs and has a hard time coming up with any benefits. I believe tradition is the strongest argument for maintaining the myth, but that doesn't speak to any direct benefit in maintaining it. Of course it is fun watching the children get excited when they see Santa and make their visit with him. I will add a potential self-esteem cost of children believing Santa favors one child or family over another based on what he leaves. Why Japan has better gadgets than the United States (via Marginal Revolution). Unlike in the United States, where consumer electronics is an overwhelmingly male-driven industry, the critical vector in the propagation of keitai culture was its embrace by adolescent girls. That this demographic drives the market is no coincidence. Like many Japanese marketers, NTT DoCoMo had determined that i-Mode would live and die based on whether teen fashion queens adopted the handsets as the season's must-own accessories. A year and a half of aggressive marketing later, with 30 million active users, DoCoMo became the world's largest Internet access provider, surpassing longtime leader America On-Line. More than 10 million of these users are young women. AlmostPositive.com: Gone, cannot find server. The domain is available for purchase. TheWebIsFun.com: Gone, two links to directory scrapped indexes. XFL2002.com: Gone, cannot find server. The domain is available for purchase. Married4Life.com: Gone, a stern "Forbidden" warning. eLamazeCoach.com: Gone, cannot find server. The domain is available for purchase. SongsInYourHead.com: Gone, cannot find server. AstroKeyboard.com: Gone, cannot find server. The domain is available for purchase. HindsightTravel.com: Gone, cannot find server. The domain is available for purchase. SpamWarehouse.com: Gone, cannot find server. BiliteralAnagrams.com: Gone, cannot find server. The domain is available for purchase. Zero for 10. None of these sites appeared to have a compelling business model - YesterdaysWeather.com offered 100% accurate weather forecasts, exactly 24 hours old - but it's surprising none of the sites are still around. Sacked for selling the Queen's pudding. There are markets for everything. An online game player paid $26,500 for virtual land in the game Entropia. Yahoo just launched traffic reports to go along with its map service. Visually the Yahoo report for Atlanta is more appealing than MSN's traffic report. MSN does, however, seem to offer more detail on what is causing traffic problems. Update: On further study it looks like Yahoo is adding some detailed information in popups when incidents occur. "Last year, profits from warranties accounted for all of Circuit City's operating income and almost half of Best Buy's." Coffee bean supply deficit looms.